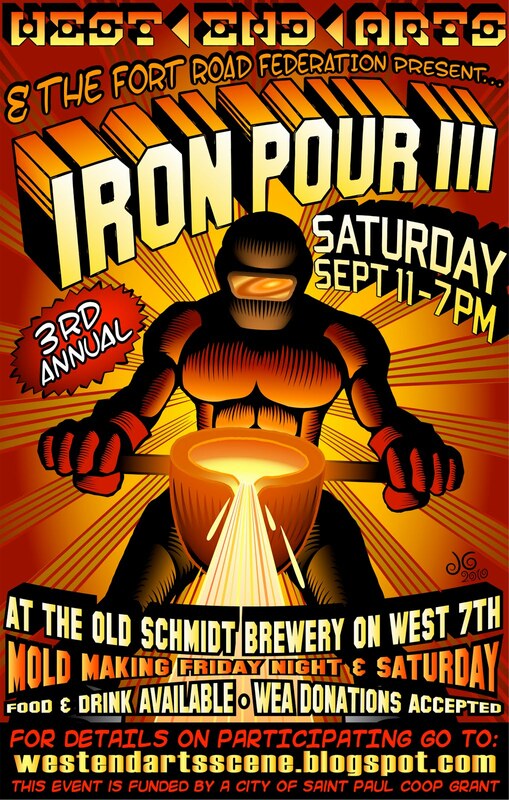 Second annual Iron Pour a success! 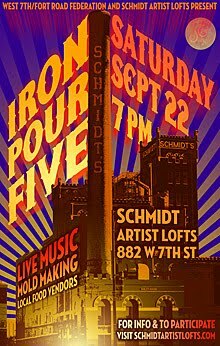 While Dave Thune's rock & roll band, "The Back Seat Boogey Band," provided the background music, the Ironhead team, dressed in futuristic silver trench coats with equally other-worldly sci-fi helmets, popped the cork on the iron furnace Saturday night. Despite cool temperatures, artisans and community members huddled together in anticipation to watch the golden liquid flow into their carefully prepared sand molds. The fire department was on hand in case the fiery sparks flew too far and fly they did. 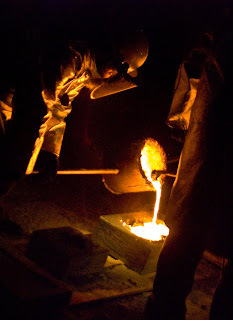 It was exciting evening, with everyone's mold getting a dose of hot iron. 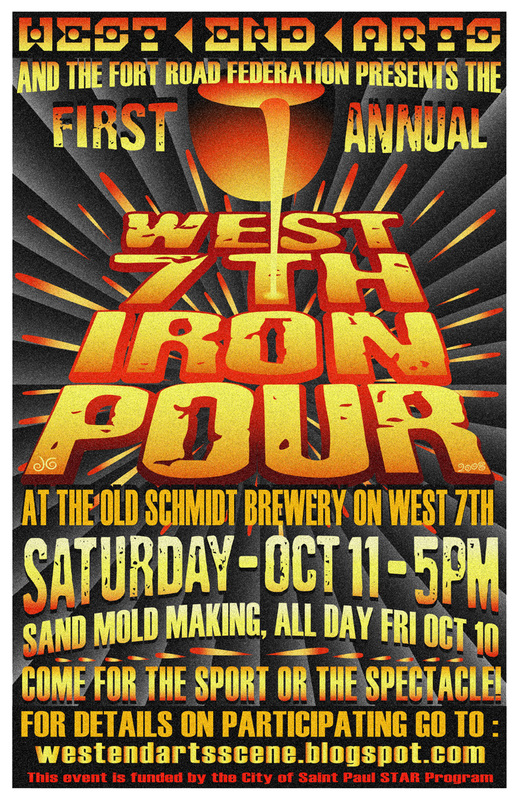 Sunday, the sand molds were cracked opened to "ooohs" and "ahhhhhs" as sand was brushed away from the iron. 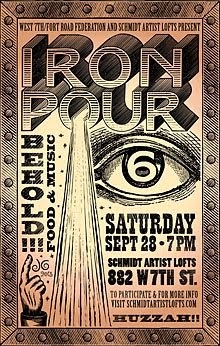 Those who participated in the pour walked away with a prized piece of personal art. But wait! There's more you can do to make your iron sculpture really shine. 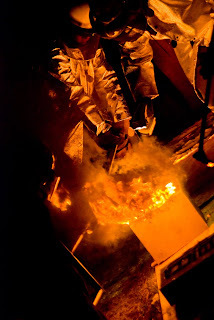 Here are a few ideas from Marty Hicks, West End sculptor and metalworker. Marty Hix submitted the above. 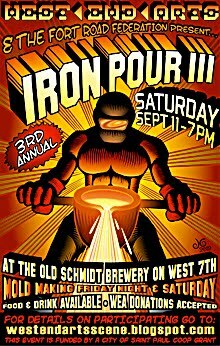 Meeting began with an Iron Pour Poster Pitch and folks agreed to plaster them all over the place and all agreed that was a really good thing! 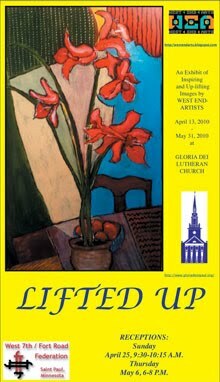 At 7:21 PM Nance opened the meeting with the first agenda item: West End’s Arts on the Web. She discussed the history wherein it was determined it would be easiest to create and maintain a “blog” as opposed to a full-blown web page. There has existed some confusion as to how to use and who should be able to use this site. There are actually two blogs connected by links. If any WEA member wants something added to the blog please contact Nance Derby, WEA Coordinator or Deborah Padgett, WEA Co-Coordinator and Minister of Information (MOI). 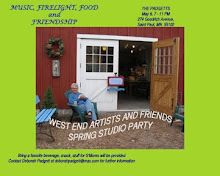 They share this email address: westendarts@fortroadfederation.org The blog sites are also linked to the Fort Road Federation website. Jason Gorski raised the possibility that interested members who want to create a germane blog can certainly do so, then let us know and we can link it to the WEA blog sites. There was a bit of discussion regarding Art as Business and the changing art market and challenges it presents in the current economy (not that it’s every been a simple thing to market fine art…) General discussion, some nostalgia and reminiscences of Minneapolis Warehouse district and the good old days and some talk of attracting a gallery and the huge commissions they need to take to stay in business and how likely/unlikely any given artist may be in attracting the uninterrupted attention of a dealer or agent or patron to the extent of being able to earn a living (or anything at all for that matter) from their heart’s work… that is, art making. We talked about the future possibility of getting the St. Paul Art Crawl map to include the West End, since, someone pointed out, it’s no further from city center than the lofts and galleries currently featured as the map’s epicenter. Padgett talked about pros and cons and costs and the like of setting up a merchant services account to accept credit cards. The Padgett’s were trying out full participation in the Art Crawl this time and will report back how it went. Jason Gorski updated the group on his progress in establishing a 2nd annual art show at the Pilney. There’s another group in there doing a monthly collaborative… The W. 7th Collective. Jason will work with the Boones (great people). Committed to approach them next week. 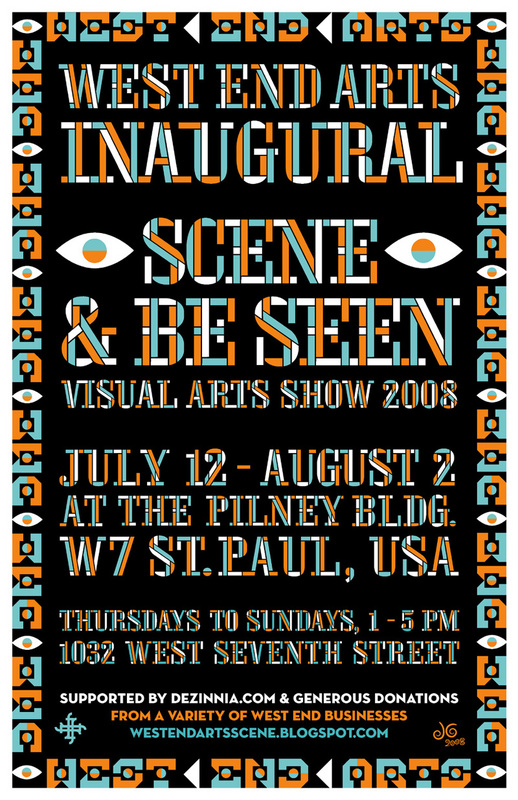 There was talk that the show would not necessarily have to be at the PIlney. 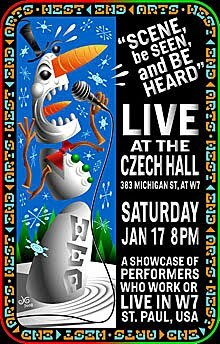 If we’re going to call it the 2nd annual something or other it would perhaps have to take place before the end of the year. Maybe early Spring will have to be soon enough. JASON COMMITTED TO NAILING DOWN THE PILNEY. 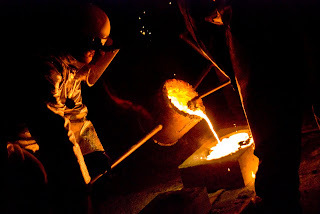 Next we were updated on Iron Pour details. Quite a long list of people requesting tiles. Marty called about dumpsters and biffys. It was determined participants outside of neighborhood would pay $50 to cast something because grant is for neighborhood residents. Jason offered to make a sign out of plywood. It was determined where sign would be placed. Someone agreed to collect $$$$. Mary Esch brought in the WEA banner. Mary Esch agreed to take photos which will, very shortly be published on this blog along with glowing reviews of the occasion. Nance talked a bit about she and K. Thune’s connection with Bridgeview/Lynwood and/or Monroe schools to help with scratch tiles… paring mainstreamed kids with non-mainstreamed kids. Kudos to Katy Thune who, we were told, is a real whipper-snapper and really got onto the school kid connection aspect of this event. They’ve created a PowerPoint presentation and the future looks bright for future collaborative effort. we don't have an unlimited supply and hope you will all come out to see the event. 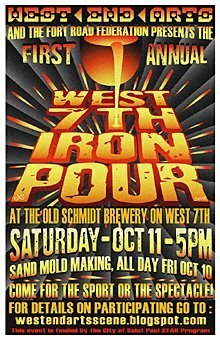 West End Arts (WEA) and the Fort Road Federation are sponsoring the second annual West End Arts Iron Pour October 9, 10 and 11 at the Schmidt Brewery on West Seventh. 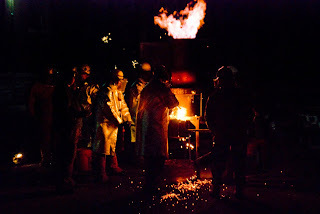 Community members can choose to sit back and enjoy the pyrotechnics or participate in the pour by creating a design in a scratch tile sand mold. 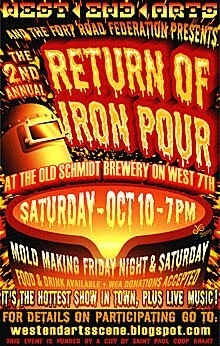 Scratch tile sand molds will be available at the mold-making session on Friday, October 9 from 5:00 to 8:00 p.m.
A second mold making session is scheduled for Saturday, October 10 from noon to 3:00 p.m. If you wish to participate, reserve your scratch tile by emailing: westendarts@fortroadfederation.org. 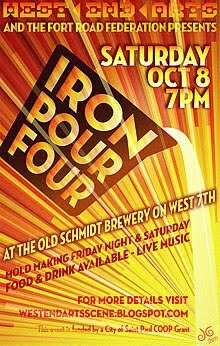 The actual pour is Saturday, October 10 from 7:00 to 10:00 p.m.
Live music provided by Dave Thune's classic sixties rock & roll band, "The Back Seat Boogey Band." Hot dogs and refreshments will be sold. On Sunday, October 11 there will be pulling of the sculptures and clean up at 11:00 a.m.